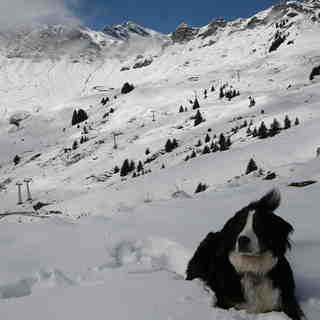 Is it snowing in Champéry ?¡Gracias! Champéry, in Switzerland, is a large resort with 35 lifts (16 chair lifts, 20 surface lifts) that offers skiers an incredible 1237 metres (4058 feet) of vertical descent. 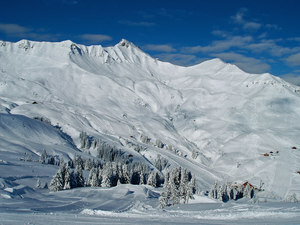 Champéry has 1665 acres of terrain over 58 pistes. The area is best suited to beginner skiers and snowboarders but there is some terrain for both expert and intermediates. There are 10 kilometers (6 miles) of cross country ski trails at Champéry. For snowboarders, there is a terrain park and a half pipe. The closest airport is at Geneva but the transfer time is 1.5 hours. Champéry has a train station. There is accommodation located close to the pistes but we would welcome additional information about any hotels or chalets in the Champéry area. Nestled at the base of the Dents du Midi and the Dents Blanches, at the end of the Vallée d’Illiez, sits the idyllic village of Champéry. This typical Swiss mountain village in the heart of the immense French-Swiss recreational area called Les Portes du Soleil is the perfect home-away-from-home from which to explore the surrounding regions. Here, sports enthusiasts enjoy an endless range of activities, while leisure-seekers can just rest and soak up the cosy atmosphere. For more than 150 years, Champéry has been one of the foremost tourist destinations in Switzerland, charming visitors from all over the world. Everything started with the opening of the luxurious Hotel Dent-du-Midi in 1857. 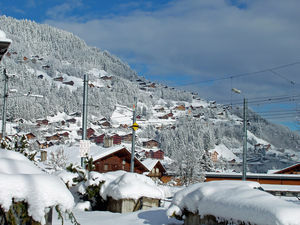 In 1969, Champéry became one of the founding villages of Portes du Soleil. To this day, the Champerolains’ enterprising spirit endures and is evidenced by our continued efforts to renew and develop village infrastructures. The Champéry – Planachaux cable-car (125 passengers) and the new 6 seater chairlift in Grand-Paradis will whisk you away to an altitude of 2000 metres in just under 5 minutes, depositing you right on the doorstep of the immense Portes du Soleil recreational area. With 194 ski lifts and over 650 km of ski slopes, this is the largest international ski area in the world. 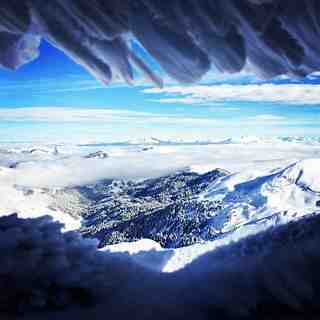 The Portes du Soleil isn’t just skiing, however. Numerous other activities include cross-country skiing, winter walks, paragliding or snowshoeing. Finally, after an eventful day, there is nothing better than a delicious fondue and a chilled glass of white wine in one of the many traditional restaurants in and around Champéry. Night owls who still have the energy after a hard day on the slopes can prolong the fun into the wee hours at the many local bars and discos. Summer is an excellent time to visit Champéry. The Portes du Soleil recreational area keeps 24 chairlifts open for the summer, giving access to over 600 km of paths just waiting to be explored on foot, on horseback or by mountain bike. 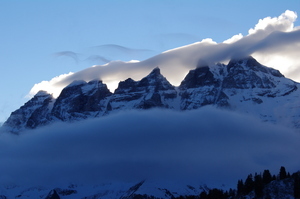 The Dents du Midi and the Dents Blanches mountain ridges also offer numerous well-marked walks and hikes with breath-taking views at every turn. Champéry’s Palladium (a National Centre for Ice Sports) offers a modern infrastructure for indoor and outdoor activities and regularly hosts national and international ice-sports training camps and competitions. Accrobranche, a new adventure course in the treetops, is our most recent addition to an already diverse panoply of summer activities which include fishing, hiking, horseback riding, Via Ferrata, canyoning, and paragliding. To round out your visit, a trip to our open-air museum, breakfast on a working farm or a leisurely stroll down our beautifully traditional village main street adds a memorable touch of local culture. When it comes to adventure, relaxation and culture, we have all the ingredients for a perfect holiday right in and around Champéry. We won’t give away the recipe, but it might include a pinch of history and mystery at the medieval castles of Aigle and Chillon, a piquant blend of local museums and exhibitions and a heady mix of amusement and adventure parks for families and thrill-seekers alike, all topped off with a generous dollop of fresh air, spectacular scenery and a smooth finish at the local thermal baths or a sun-drenched cruise on Lake Geneva. As if the Portes du Soleil weren’t enough unto itself, the winter months in Champéry are packed with weekly events, competitions and activities. The heart-stopping Chavanette Session is an all-comers ski race in which teams of competitors hurtle themselves down the vertiginously bumpy slope of the world-renowned ‘Swiss Wall’. The Grand Odyssée is an unforgettably spectacular dog-sled race which blows through Champéry like an arctic gale. And nobody throws a party like the Superpark.ch when they’re hosting freestyle skiing and snowboarding events. In summer, Champéry is a mecca for mountain biking and the Bikepark.ch regularly holds prestigious national and international mountain bike competitions. 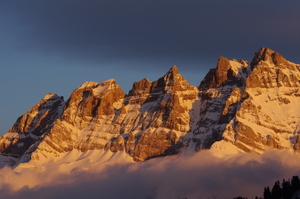 Lest modern thrill-seekers forget, however, Champéry also has a long history of agriculture and artistry. Summer events such as livestock fairs, our popular handicraft market and the colourful August 1st national holiday celebrations showcase local traditions. Throughout the year, the Champéry Palladium hosts different concerts, events and competitions. The Flâneries Musicales of Champéry literally means musical meanderings, and is a unique classical music festival where concerts are staged in some of Champéry’s most beautiful places, both indoors and out. Summer 2008 also saw the introduction of a hilarious new addition to the social calendar, the much-appreciated Maxi-Rires comedy festival. Champéry’s well-preserved village main street will charm you with its quaint, alpine village architecture. The historic bell tower and the wooden chalets’ unique rooflines are age-old bastions of tradition in the heart of the village, while the ultra-modern Palladium and the cable-car are audacious advocates of progress and modernity at the foot of town. Champery is a unique and unforgettable mix of history and modernity, an oasis of peace and tranquillity in the Swiss Alps, yet just a stone’s throw from Geneva International airport and easily accessible by car and train. We wish you a very warm welcome and hope you’ll make yourselves right at home! Champery is one of the best places from which to ski the Portes du Soleil ski area with masses of fast lifts and over 600km of well-treated pistes. It's easy to get right over to Les Gets, Avoriaz, Morzine, Chatel and Morgins. There is masses of new accommodation to rent from Avanthay or MDK immobiliers, (we stayed at Chamath with four bedrooms and sleeps 8 from Avanthays). Champery has become much livelier in the past few years with great restaurants and enough night-life and bars but without losing its village charm and beauty. It was just about the first ski village to be established over a century ago. If you only want to ski for 5 hours or half a day you can buy a 'Swiss side only' pass which covers Champery, Crozets, Champoussin, Morgins and right over to Torgon which overlooks Lake Geneva. And don't forget the famous Swiss Wall, one of the toughest black runs in Europe; not to be attempted after a long liquid lunch in one of the many restaurants on the pistes!. There are, of course, plenty of blues and reds with a few blacks to test you. Good luck and happy skiing.